Clap your hands together, all you peoples; O sing to God with shouts of joy. For the Lord Most High is to be feared; he is the great King over all the earth. The nobles of the peoples are gathered together with the people of the God of Abraham. For the powers of the earth belong to God and he is very highly exalted. Great is the Lord and highly to be praised, in the city of our God. His holy mountain is fair and lifted high, the joy of all the earth. On Mount Zion, the divine dwelling place, stands the city of the great king. In her palaces God has shown himself to be a sure refuge. For behold, the kings of the earth assembled and swept forward together. They saw, and were dumbfounded; dismayed, they fled in terror. they writhed like a woman in labour, as when the east wind shatters the ships of Tarshish. That you may tell those who come after that such is our God for ever and ever. Blow the horn in Gibeah, the trumpet in Ramah. Sound the alarm at Beth-aven; look behind you, Benjamin! among the tribes of Israel I declare what is sure. on them I will pour out my wrath like water. Ephraim is oppressed, crushed in judgement, because he was determined to go after vanity. Therefore I am like maggots to Ephraim, and like rottenness to the house of Judah. then Ephraim went to Assyria, and sent to the great king. But he is not able to cure you or heal your wound. I will return again to my place until they acknowledge their guilt and seek my face. Your love is like a morning cloud, like the dew that goes away early. Triumphalism - is there ever a place for it? I'm one of those sad people who believe that God really is the 'Lord of All' and that with one word (although I prefer Jeremy Begbie's 'one chord' or 'one note' - how great to think God 'sang' it all into being) caused everything that is to be. After all, if the Big Bang was 13.7bn years ago then the scientific question has to be what or who caused it! (I'd also be interested to hear how we find ourselves in the right place (as the third rock from the hot thing) to live with all the conditions (temperature, gravity and more besides) to actually support life and the chance of that life being is another great issue to discuss one day too!). cry in the morning; for if a loud shout is a pain and a vexation I'll leave it to you to guess at what order of magnitude this is magnified by! 'Our God is able, ALL you need to do is merely rebuke satan and he will flee,' they cry. And the sadness is that in all reality that words are true, but not as they understand or use them! I believe that God heals - in fact in my time as a God-botherer I have prayed for blind people and they saw (I'll have to tell you that story some time) and I believe that when we call upon the LORD, He hears and acts. The problem is that more often than not it is the Christian who 'live with a thorn in their side' who more often than not will quote the Hinns, Meyers, Cerullos and others of the glam Christian Evopersonality types that cause me the most trouble, for they take authority over what is with (or within them) when they should be letting it humble and temper them. They live in victory and yet exist in chains! You probably know the type - one minute they are limping along and the next they are singing hallelujahs and claiming everything in sight - binding this and claiming that and living in the freedom of God for a few minutes before they swing back the other way. The problem is that their problem wounds others and makes God look like a woman buying a hat (I know this first hand as my mother usually left with the same thing she cam in with!). i. The Apostle Paul had his problems and so too, will we. I don't think it is always valid to rebuke stuff and bind, cast out or claim in the name of Jesus' to overcome all of ours. What we need is to pray for peace, acceptance, solution, people to come alongside (it's called being a paraclete) and (most of all) God's presence, inspiration and strength. a. If being Christian meant we didn't die a mortal death, then everyone would be in Church. b. All the time we get is what we get and we need to live it well for tomorrow we may not be here - so 'carpe diem' (or as my predictive texting once had it: 'Carpet Firm'). Be the best you can be today for tomorrow might not come! c. Death, and illness, are always with us - now I have prayed and seen healings that can only be regarded as miraculous - and I have prayed and watched people make promises, claims and be disappointed (and wound many). We need to pray intelligently, listening to God and praying with Him - not ordering Him to do as we command (the clue is that He is God not a blessed genie!). The trite -'All you need to do is claim it in God's name - rebuke it and it will be gone!' is great, especially when you can see the reality of it in the witness of the person making that statement - but sadly, too often that is rarely the case. Our God is able to do the very best for us at all time and in all situations - but when we place ourselves in certain places, the outcomes are limited and the opportunities for redemption when we have painted ourselves into a corner are few an far between. The over-reached and realised eschatological wonderland that is triumphalism is a curse. It is a curse spoken out against God for when these well-meaning (aren't they always?) people call upon God and nothing happens they make Him out to be like Baal in 1 Kings 18 with the result that others ask where He might be - 'Is He on the toilet or otherwise indisposed?' they mock. In Jesus the final victory is won, but this doesn't mean we won't have to face battles now. We do have authority but we also have discernment and wisdom and the Word (living and written) and the indwelling of the Holy Spirit and these (and more besides) come together to make us a force to be reckoned with, unless we shoot into the air (and wonder why some around us fall)! One of the biggest buzzes I ever had was to realise that anyone can resist satan but we have even more clout and authority because 'He who is in us is greater than he who is in the world! We have riches in heaven and riches on earth and we need to discern which we store up where. Too often our possessions possess us. Although we stand before those who oppose us, in ALL things we are more than conquerors (and I've buried a number of obviously healed people - they just still had the disease that killed them!) and we indeed will overcome (as the spiritual tells us). We aren't fatalistic or defeated but neither do we proclaim, or claim, what obviously isn't. It is OK to be depressed. It is OK to be ill. It's even OK to have terminal illness (and I have had some good teachers on this subject for my role is to help people die well). Where people make great claims in the lives of others when they don't come near in their own - when they preach about walking in the light when it's obvious they aren't - when they don't see how they don't have a job, or a partner, or a house or a new car or whatever when they are 'a child of the Living God', then they've lost the plot and are in need of a size nine commando boot up the bum! We are indeed in a perpetual victory parade - a parade which I am led to understand relates to the parading of one's defeated foes - and one which has before it an empty cross and a broken and powerless sin (for if the penalty is gone so too is the power!). we live to demonstrate that the hold that sin had over us is no more we lead in triumph (sin behind us and satan humiliated) with Jesus before us (for we know who we follow) for we too are His friends AND servants (hallelujah?). your arrows will be sharp in the heart of the king’s enemies, so that peoples fall beneath you. Though the waters rage and swell, and though the mountains quake at the towering seas. There is a river whose streams make glad the city of God, the holy place of the dwelling of the Most High. God is in the midst of her; therefore shall she not be removed; God shall help her at the break of day. The nations are in uproar and the kingdoms are shaken, but God utters his voice and the earth shall melt away. Come and behold the works of the Lord, what destruction he has wrought upon the earth. He makes wars to cease in all the world; he shatters the bow and snaps the spear and burns the chariots in the fire. but I will punish all of them. Their deeds do not permit them to return to their God. but they will not find him; he has withdrawn from them. Now the new moon shall devour them along with their fields. What do I imply then? That food sacrificed to idols is anything, or that an idol is anything? No, I imply that what pagans sacrifice, they sacrifice to demons and not to God. I do not want you to be partners with demons. You cannot drink the cup of the Lord and the cup of demons. You cannot partake of the table of the Lord and the table of demons. Or are we provoking the Lord to jealousy? Are we stronger than he? ‘All things are lawful’, but not all things are beneficial. ‘All things are lawful’, but not all things build up. Do not seek your own advantage, but that of others. Eat whatever is sold in the meat market without raising any question on the ground of conscience, for ‘the earth and its fullness are the Lord’s.’ If an unbeliever invites you to a meal and you are disposed to go, eat whatever is set before you without raising any question on the ground of conscience. But if someone says to you, ‘This has been offered in sacrifice’, then do not eat it, out of consideration for the one who informed you, and for the sake of conscience—I mean the other’s conscience, not your own. For why should my liberty be subject to the judgement of someone else’s conscience? If I partake with thankfulness, why should I be denounced because of that for which I give thanks? So, whether you eat or drink, or whatever you do, do everything for the glory of God. Give no offence to Jews or to Greeks or to the church of God, just as I try to please everyone in everything I do, not seeking my own advantage, but that of many, so that they may be saved. There is no faithfulness or loyalty, and no knowledge of God in the land. the prophet also shall stumble with you by night, and I will destroy your mother. because you have rejected knowledge, I reject you from being a priest to me. And since you have forgotten the law of your God, I also will forget your children. they changed their glory into shame. I will punish them for their ways, and repay them for their deeds. because they have forsaken the Lord to devote themselves to whoredom. Wine and new wine take away the understanding. My people consult a piece of wood, and their divining-rod gives them oracles. For a spirit of whoredom has led them astray, and they have played the whore, forsaking their God. They sacrifice on the tops of the mountains, and make offerings upon the hills, under oak, poplar, and terebinth, because their shade is good. Though you play the whore, O Israel, do not let Judah become guilty. can the Lord now feed them like a lamb in a broad pasture? You are my helper and my deliverer; O my God, make no delay. Be exalted, O God, above the heavens and your glory over all the earth. That your beloved may be delivered, save us by your right hand and answer me. O grant us your help against the enemy, for earthly help is in vain. Through God will we do great acts, for it is he that shall tread down our enemies. and I will sow him for myself in the land. For though I am free with respect to all, I have made myself a slave to all, so that I might win more of them. To the Jews I became as a Jew, in order to win Jews. To those under the law I became as one under the law (though I myself am not under the law) so that I might win those under the law. To those outside the law I became as one outside the law (though I am not free from God’s law but am under Christ’s law) so that I might win those outside the law. To the weak I became weak, so that I might win the weak. I have become all things to all people, so that I might by any means save some. I do it all for the sake of the gospel, so that I may share in its blessings. Tonight's episode of 'Call the Midwife' dealt with the issue of neonatal death; an issue that once it has visited a family never really goes away. I was doing so well today and then this blinking programme turned up and as the story unfolded I found myself with tears running down my face and myself taken back to the very first time I fund myself in a room with a Mum, easing her to a place where we could pray and ease the child towards the waiting female member of the undertaker's staff. I have to be honest and say that there are timers when the blessed resonances that all pastoral encounters leave behind not only ground you but also give you exquisitely painful insights into God's love for His child and the pain that separation, for our sake, brought Him. There will be many for whom the pain is revisited as the wounds of loss are re-examined and made real once again. For those who find tonight's episode may they find healing, wholeness and restoration. For those who have gone: May God grant them eternal rest (dona eis requiem). Topical and fun - an opportunity to you bright people out there to come up with something to make us smile. 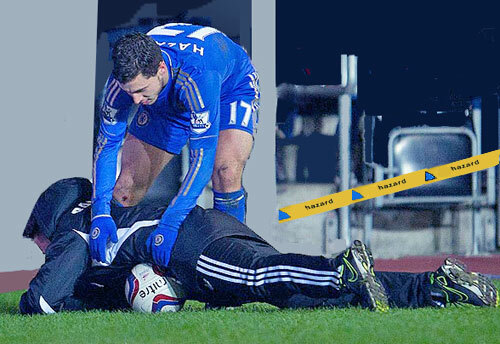 Benitez (to Eden Hazard): "No what I said was 'get out there and kick that ball boy, we desperately need a goal!' "
Because of your great strength your enemies shall bow before you. Come now and behold the works of God, how wonderful he is in his dealings with humankind. the river they passed through on foot; there we rejoiced in him. In his might he rules for ever; his eyes keep watch over the nations; let no rebel rise up against him. Who holds our souls in life and suffers not our feet to slip. For you, O God, have proved us; you have tried us as silver is tried. which my lips uttered and my mouth promised when I was in trouble. Come and listen, all you who fear God, and I will tell you what he has done for my soul. I called out to him with my mouth and his praise was on my tongue. But in truth God has heard me; he has heeded the voice of my prayer. nor withheld his loving mercy from me. Made me Laugh - Created, Not Made? 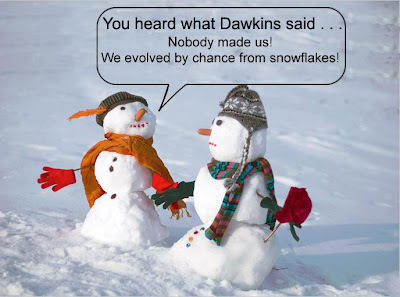 I have to admit that this image not only made me laugh but gives some perspective to the whole science vs religion debate. Deserves the S'Nobel prize perhaps? Christianity - Free Lamborghini or McLaren anyone? Last night saw the second evening of an Alpha course that we are running jointly with our local Methodists and as we chatted about the Cross and addressed the question, 'Why did Jesus die?' I became very aware of the fact that, generally speaking, many churches (and members) I engage with appear to fail to make the cost of commitment real and obvious. The 'Why' for God and the 'What' for us are both clearly visible. iii. The becoming of a new creation - through the indwelling and enabling of the Holy Spirit, one that is about to live within the freedom of 'free choice' making the right choices (and wrong choices, when they are taken, less often). And all we have to do is accept it and keep it on the road. But it is just too easy to have God bear all the cost and us live with all the benefits. There is a cost for us too and many of my friends over the years have paid out (often sacrificially in terms of money, marriages and relationships) to keep cars on the road, aircraft in the air and radios on the airwaves. Others have devoted free time to trains (real and model) or stamp collecting or many of the other hobbies people have, and this is where it gets hard for me when it comes to Christianity. I know people who put everything on the line for a hobby and know many people who claim to be Christian and yet are willing to do nothing but accept and demand and give the very minimum in time, money and energy. If I were to offer you one of the top marques of car (Ferrari, Lamborghini, McLaren, etc.) free of charge, how many would take my hand off in the rush to accept it? But to keep a car like that on the road take some real commitment (and it's not just money I'm talking of here). A friend with one such car told me how it cost him 'a few thousand' every year to keep his beloved super car on the road and yet, he claimed, it was worth it because look at what he had! And oddly, these are also more, often than not the same people who complain about the lack of things being done in the church. They are the same people who wished to be served and to be cared for and to be provided for and to be made happy and listened to and obeyed (yep - that too) and yet they don't put anything in to keep the vehicle that is the church or the component that is their life working effectively and efficiently. Are you willing to pay (and I don't mean with mere money) to keep your faith on the road? Is your faith an interest (your hobby) or a life-changing, life-long commitment? Are you willing to pay what it takes or merely willing to take? The time is coming when we need to realise that if you merely wish to be an associate member (and you're welcome as such) then you will also have to realise that whilst we can guarantee a life membership being open for you in Church, we cannot guarantee and eternal life membership. the shield, the sword and the weapons of war. to save all the meek upon earth. A wife is bound as long as her husband lives. But if the husband dies, she is free to marry anyone she wishes, only in the Lord. But in my judgement she is more blessed if she remains as she is. And I think that I too have the Spirit of God. But my people would not hear my voice and Israel would not obey me. So I sent them away in the stubbornness of their hearts, and let them walk after their own counsels. Those who hate the Lord would be humbled before him, and their punishment would last for ever. But Israel would I feed with the finest wheat and with honey from the rock would I satisfy them. ‘The end has come upon my people Israel; I will never again pass them by. I will make the sun go down at noon, and darken the earth in broad daylight. I will make it like the mourning for an only son, and the end of it like a bitter day. not a famine of bread, or a thirst for water, but of hearing the words of the Lord. they shall run to and fro, seeking the word of the Lord, but they shall not find it. In that day the beautiful young women and the young men shall faint for thirst. Those who swear by Ashimah of Samaria, and say, ‘As your god lives, O Dan’, and, ‘As the way of Beer-sheba lives’ - they shall fall, and never rise again. Now concerning the matters about which you wrote: ‘It is well for a man not to touch a woman.’ But because of cases of sexual immorality, each man should have his own wife and each woman her own husband. The husband should give to his wife her conjugal rights, and likewise the wife to her husband. For the wife does not have authority over her own body, but the husband does; likewise the husband does not have authority over his own body, but the wife does. Do not deprive one another except perhaps by agreement for a set time, to devote yourselves to prayer, and then come together again, so that Satan may not tempt you because of your lack of self-control. This I say by way of concession, not of command. I wish that all were as I myself am. But each has a particular gift from God, one having one dailykind and another a different kind. To the married I give this command—not I but the Lord—that the wife should not separate from her husband (but if she does separate, let her remain unmarried or else be reconciled to her husband), and that the husband should not divorce his wife. ‘All things are lawful for me’, but not all things are beneficial. ‘All things are lawful for me’, but I will not be dominated by anything. ‘Food is meant for the stomach and the stomach for food’, and God will destroy both one and the other. The body is meant not for fornication but for the Lord, and the Lord for the body. And God raised the Lord and will also raise us by his power. Do you not know that your bodies are members of Christ? Should I therefore take the members of Christ and make them members of a prostitute? Never! Do you not know that whoever is united to a prostitute becomes one body with her? For it is said, ‘The two shall be one flesh.’ But anyone united to the Lord becomes one spirit with him. Shun fornication! Every sin that a person commits is outside the body; but the fornicator sins against the body itself. Or do you not know that your body is a temple of the Holy Spirit within you, which you have from God, and that you are not your own? For you were bought with a price; therefore glorify God in your body. NIL POINTS (all a bit Eurovision this isn't it?). Yes indeedy folks, that's right - NIL POINTS! Now one of my colleagues who was chair of governors at one school and was engaged in doing assemblies in four or five schools did all of this as part of their 'out of hours interest'. Turns out this isn't part of their job at all - it was their hobby! Another of colleagues (who rarely went into the local church school for assemblies and was more often than not missing from governor's meeting) who had church schools in their patch had more points (and points could mean posts when reorganisation comes a knocking) with less real engagement in the school or the community that that role should have brought. All seems a bit wrong when we start legislating for what is part of the job in such a way as we make pastoral and missional engagement something that is other than the clergy role doesn't it? But that's what we are apparently faced with (and that is a real ..... [insert you own word - I'm lost for one]!). So here's a hint for all those who read this and find they have non church schools in your area - doing them is not, apparently, part of the pastoral or parochial ministry associated with the church, it's merely your hobby. And, if you don't fancy schools ministry then all you need to do is avoid those with church schools in and you're sorted - all the others are merely a potential hobby and (of course) that's 'just not your calling' is it? *If you don't know about the Golgafrinchams, can I suggest you read the Hitchhiker's Guide to the Galaxy? Alas for those who are at ease in Zion, and for those who feel secure on Mount Samaria, the notables of the first of the nations, to whom the house of Israel resorts! Cross over to Calneh, and see; from there go to Hamath the great; then go down to Gath of the Philistines. Or is your territory greater than their territory, O you that put far away the evil day, and bring near a reign of violence? and calves from the stall; who sing idle songs to the sound of the harp, and like David improvise on instruments of music; who drink wine from bowls, and anoint themselves with the finest oils, but are not grieved over the ruin of Joseph! Therefore they shall now be the first to go into exile, and the revelry of the loungers shall pass away. I abhor the pride of Jacob and hate his strongholds; and I will deliver up the city and all that is in it. See, the Lord commands, and the great house shall be shattered to bits, and the little house to pieces. and they shall oppress you from Lebo-hamath to the Wadi Arabah. When any of you has a grievance against another, do you dare to take it to court before the unrighteous, instead of taking it before the saints? And if the world is to be judged by you, are you incompetent to try trivial cases? Do you not know that we are to judge angels - to say nothing of ordinary matters? If you have ordinary cases, then, do you appoint as judges those who have no standing in the church? I say this to your shame. Can it be that there is no one among you wise enough to decide between one believer and another, but a believer goes to court against a believer - and before unbelievers at that? In fact, to have lawsuits at all with one another is already a defeat for you. Why not rather be wronged? Why not rather be defrauded? But you yourselves wrong and defraud—and believers at that. Do you not know that wrongdoers will not inherit the kingdom of God? Do not be deceived! Fornicators, idolaters, adulterers, male prostitutes, sodomites, thieves, the greedy, drunkards, revilers, robbers - none of these will inherit the kingdom of God. And this is what some of you used to be. But you were washed, you were sanctified, you were justified in the name of the Lord Jesus Christ and in the Spirit of our God. The Lord brings the counsel of the nations to naught; he frustrates the designs of the peoples. But the counsel of the Lord shall endure for ever and the designs of his heart from generation to generation. Happy the nation whose God is the Lord and the people he has chosen for his own. The Lord looks down from heaven and beholds all the children of earth. From where he sits enthroned he turns his gaze on all who dwell on the earth. He fashions all the hearts of them and understands all their works. No king is saved by the might of his host; no warrior delivered by his great strength. A horse is a vain hope for deliverance; for all its strength it cannot save. To deliver their soul from death and to feed them in time of famine. Did you bring to me sacrifices and offerings the forty years in the wilderness, O house of Israel? You shall take up Sakkuth your king, and Kaiwan your star-god, your images that you made for yourselves; therefore I will take you into exile beyond Damascus, says the Lord, whose name is the God of hosts. I wrote to you in my letter not to associate with sexually immoral persons—not at all meaning the immoral of this world, or the greedy and robbers, or idolaters, since you would then need to go out of the world. But now I am writing to you not to associate with anyone who bears the name of brother or sister who is sexually immoral or greedy, or is an idolater, reviler, drunkard, or robber. Do not even eat with such a one. At last it is snowing and everyone's rushing to buy stuff other people want in case there's a shortage. So, which biscuits do you stockpile? Labels: biscuits, panic buying, snow, stockpiling, which would you choose? for you will judge the peoples righteously and govern the nations upon earth. Give the king your judgements, O God, and your righteousness to the son of a king. Then shall he judge your people righteously and your poor with justice. may prayer be made for him continually and may they bless him all the day long. may its fruit flourish like Lebanon and its grain grow like the grass of the field. may all nations be blest in him and call him blessed. Blessed be the Lord, the God of Israel, who alone does wonderful things. May all the earth be filled with his glory. Amen. Amen. forsaken on her land, with no one to raise her up. and that which marched out a hundred shall have ten left. for Gilgal shall surely go into exile, and Bethel shall come to nothing. Ah, you that turn justice to wormwood, and bring righteousness to the ground! and so the Lord, the God of hosts, will be with you, just as you have said. it may be that the Lord, the God of hosts, will be gracious to the remnant of Joseph. I have applied all this to Apollos and myself for your benefit, brothers and sisters, so that you may learn through us the meaning of the saying, ‘Nothing beyond what is written’, so that none of you will be puffed up in favour of one against another. For who sees anything different in you? What do you have that you did not receive? And if you received it, why do you boast as if it were not a gift? Already you have all you want! Already you have become rich! Quite apart from us you have become kings! Indeed, I wish that you had become kings, so that we might be kings with you! For I think that God has exhibited us apostles as last of all, as though sentenced to death, because we have become a spectacle to the world, to angels and to mortals. We are fools for the sake of Christ, but you are wise in Christ. We are weak, but you are strong. You are held in honour, but we in disrepute. To the present hour we are hungry and thirsty, we are poorly clothed and beaten and homeless, and we grow weary from the work of our own hands. When reviled, we bless; when persecuted, we endure; when slandered, we speak kindly. We have become like the rubbish of the world, the dregs of all things, to this very day. I am not writing this to make you ashamed, but to admonish you as my beloved children. For though you might have ten thousand guardians in Christ, you do not have many fathers. Indeed, in Christ Jesus I became your father through the gospel. I appeal to you, then, be imitators of me. For this reason I sent you Timothy, who is my beloved and faithful child in the Lord, to remind you of my ways in Christ Jesus, as I teach them everywhere in every church. But some of you, thinking that I am not coming to you, have become arrogant. But I will come to you soon, if the Lord wills, and I will find out not the talk of these arrogant people but their power. For the kingdom of God depends not on talk but on power. What would you prefer? Am I to come to you with a stick, or with love in a spirit of gentleness? Caption Contest - 1001 uses for a horse? Be an Evangelist - Get a seat during rush hour! Shoot the Wounded - excuse the wrong? Sauron - Made me smile!